So you found a mentor – that’s great! Now the question is – do you have a sponsor? While a mentor can come from any level of the organization, a sponsor is someone with power who will use their political and social capital to help further your career. Sponsors may give you a promotion or provide you with a stretch assignment or career-building opportunity. They may provide protection and help you recover from a mistake or misstep. They may speak up and advocate for you with their peers. A sponsor may just see or hear about you and act, and, unless you ask, you may never know that there was an invisible hand behind an opportunity you were given. You can develop mentors or actively engage in mentoring conversations, but you must attract sponsors. Do the right things to attract the attention of potential sponsors. Begin by making sure you are performing at a consistently high level. Think about how you can stand out from the crowd. What can you do to consistently add value to your team and organization? How can you leverage your unique talents and strengths so that potential sponsors can see what you’re capable of doing? How can you increase your visibility with upper management? Once you attract a sponsor, do what you can to support and champion them, show your appreciation and loyalty, and continue to contribute to the business with sustained, visible high performance. 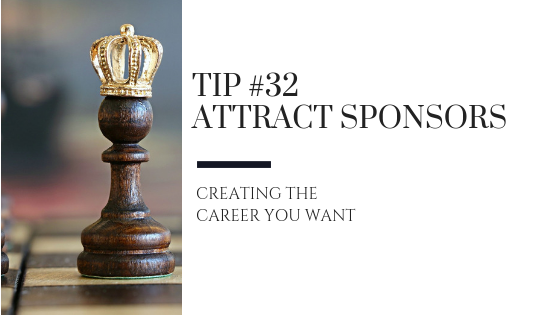 There are any number of ways that you can put yourself out there, so start doing something to attract the attention of potential sponsors to help create the career you want.